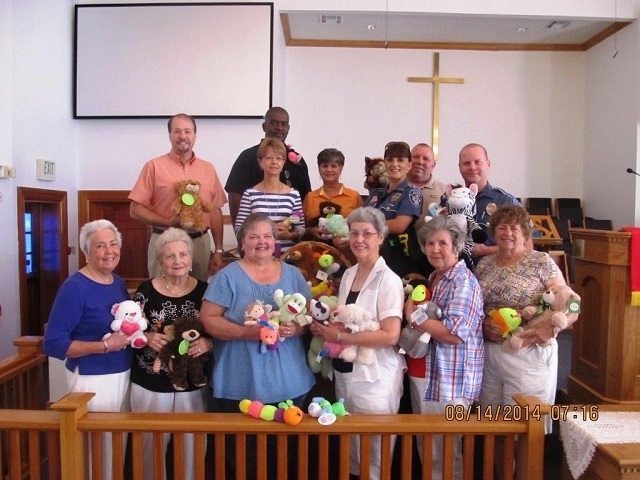 The Emmie Montegudo Circle of First United Methodist Church in Zachary collected new stuffed animals, and recently presented them to the Zachary Police Department. These stuffed animals will be used to comfort children, when needed, as officers respond to various situations during the course of their work. Pictured left to right, front row, are Helen Bruner, Ann Rawls, Jennifer Bass, Betty Pope, Carolyn Baxter and Olga Wilson. Back row, Rev. Ricky Willis (pastor of First UMC, Zachary), Janice White, Assistant Chief Darryl Lawrence, Connie Charlet, DARE Officer Desiree Kent, Capt. Randy Aulds and Sgt. Shane White.